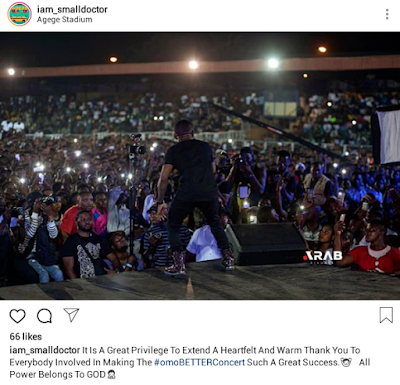 Despite the recent police case with the Nigerian singer with stage name Small Doctor, he still had a huge turn up for his concert #OmoBETTER concert. He went to his social page to thank all his fans that attended this event. "It is a great privilege to extend A heartfelt and warm Thank You To Everybody Involved in Making The #omoBETTERConcert Such A Great Success. All Power Belongs To God"